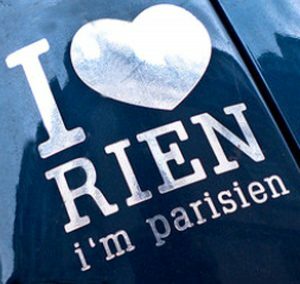 You certainly have to give Parisians credit for a collective good sense of humor when it comes to the impression they make upon some visitors to their city. 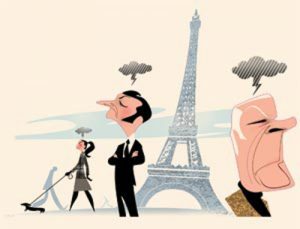 There’s a belief–even among proud Parisians themselves-that residents of the City of Light are in perpetual bad moods and that’s there’s little than can be done to raise their spirits. Hence this bumper sticker seen recently in the city (and shown above). Well, at least some Parisians have a sense of humor about their image! But truth be told, there are valid cultural reasons as to why many Americans consider the French to be stand-offish and rude and why, conversely, the French consider Americans to be demanding and needy, all of which I addressed earlier in this blog. 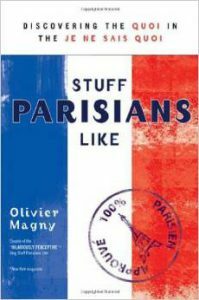 Simply understanding that what’s “good” in one nation is considered “bad” in another (for example, restaurant waiters who check up on you throughout your meal are the norm in the U.S., but such behavior would be considered intrusive and impolite in France) goes a long, long way toward shedding that image of the rude Parisian. And, of course, everyone having a sense of humor about these differences is a great place to start! This entry was posted in "Rude" American Tourists, "Rude" Parisians by Bob Adams. Bookmark the permalink. Something I noticed in my last trip, that might help visitors and may explain this impression about Parisiens: sometimes turists feel like they are “bothering” someone with a question and try to be as brief as possible, asking short phrases. WRONG! That many times offend the host, since from ancient times they expect you to start with “Excuse me, Madam, please “… and THEN start your question. With those magic starting words you will never find someone being unresponsive or rude in the answer. They just expect politeness – our objectiveness offends them. Take your time to be polite at the beginning, and you will love France each time a little more!